To speak with Lindsay, you get a sense that she is meek, affable and home spun. If you follow her career as an Elite OCR Athlete you gain entirely different picture. 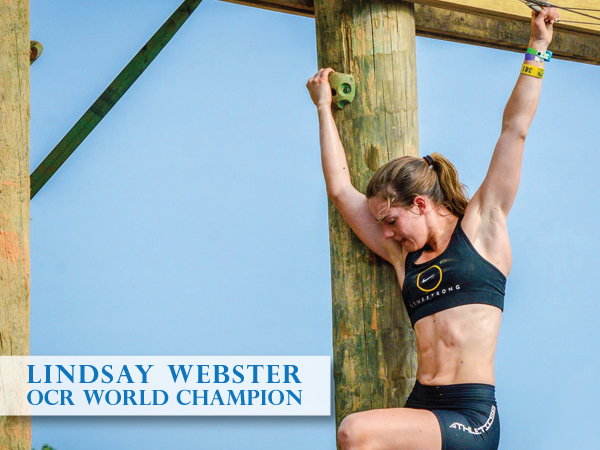 Lindsay competed in around 20 OCR events in 2015 and won most all (13 races) in which she toed the line including the OCR World Championship, 2nd in the Spartan World Championship while placing no less than 3rd in 6 of the 20 and a 4th place to round of the bunch. Suffice to say; Lindsay has had an epic year and it looks like this year will be no less impressive. Lindsay is fiancée to Ryan Atkins whom is also recognized as the most dominant competitor in the men’s pro field. He being The Worlds Toughest Mudder World Champion, both residing in Ontario Canada, they seem to swoop down to take the crowns and head back home to recover and prepare for the next challenges. Richard Diaz, our host asked Ryan if he could arrange an interview with Lindsay and here it is for your listening enjoyment.